Cara Rose DeFabio put together a map of art spaces, focusing on performance, that are no longer with us. She is inviting people to add others that might be missing. Check it out on Google Maps here. The map was created as part of a dramaturgy for The Dance that Documents Itself, opening tonight at CounterPulse and running through the 14th. You don’t know anything about Portland pif you think its suburban. A lot of those places closed over a decade ago. We do seem to love mourning here in SF, but I’d be curious to see a similar map of arts-related openings in the past 15 years. Ha I’m probably the oldest person on this blog, I moved here in the early 80s. I remember the Mission, Lower Haight, and such back then. What this map doesn’t realize is that a lot of these places were not welcome by the hipsters of the early to mid 80s. The mid 90s Mission felt insanely gentrified to us at the time, little did we realize that the first tech boom would completely alter our definition of what gentrification was. Im too old to care, but it just strikes me as funny that we’re now romanticizing the mid 90s. Oh well, I mean any time when poor weird kids could still move here is worth romanticizing I guess. Even Oakland will soon be off limits to them. The gentrifiers are now the gentrified. Gentrification is totally cool and it’s totally cool to raise the the rent prices for local small businesses by opening a bunch of cool shops and ‘art spaces’ but as soon as someone with some more money than you comes around the corner, gentrification is a terrible plague and it’s time to start a ‘class war’. You’re probably not the oldest person on this blog. Just sayin’. …some of these organizations are still around some with and some without a physical space. Intersection just cut back their programming but still exists as an incubator for new production companies and new projects. Z Space is in the Artaud building and opened a second space last year. Goat Hall still produces, I was stage manager for their production of Seven Deadly Pleasures last year at ACT’s Costume Shop (and the picture associated with their photo on the map is actually of 11th Hour Ensemble’s ‘Alice.’ which I stage managed at Theatre of Yugen’s NOHspace). Overlay that with a map of new startup incubators and coworking spaces and things are looking up! 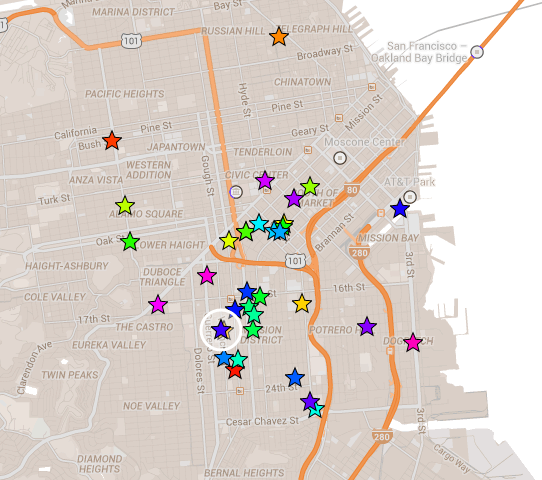 Map of shuttered SF blogs is on the horizon…..